Garak petitions Captain Sisko to let him follow a mysterious signal, aparently sent by the mentor he thought dead, Enabran Tain. This search sees our heroes stumble upon the Dominion invasion fleet that is finally making its way towards the Federation. 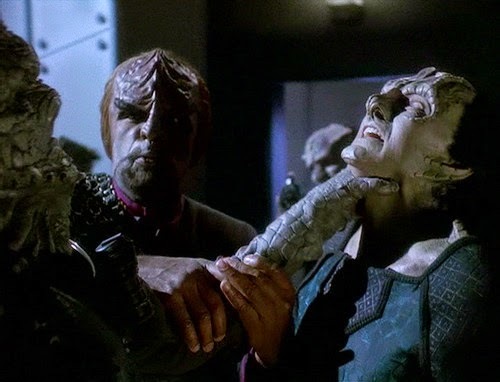 Garak is one of those guys you'd love to asphyxiate, for well or ill.
Matthew: Moreso even than most first parts of two-parters, there are a lot of balls being juggled by this story, and it's mostly successful. We've got Garak searching for Enabran Tain, Worf discovering the real Martok and Bashir, the Jem'Hadar fleet traversing the wormhole to attack DS9, Dukat and Ziyal at odds over Garak... if anything, the episode's structure suffers just a tad at having so many story threads crammed in, threads we hope will be resolved in the conclusion. The Garak tale seems the primary one here, and overall it is pretty successful. Garak's motivation was discernible and effective. His final scene with Enabran Tain was quite good - "it was the only day" was really sharp writing. Kevin: I actually don't mind the numerous story threads. I don't think any suffered per se, and it means that we avoid the inexcusable dropping of a resolved plot, like Data's dream stuff in Birthright. Also, the slightly overstuffed and chaotic plotting serves a larger purpose for the show. Events are accelerating and getting a little out of control, and oh happy day, it's interesting. I loved the Tain follow-up. It could have easily veered into soap opera territory with the reveal, but the work both the writers and actors put into every scene between the two made it feel like the natural resolution and not a cheap ret-con. Matthew: The Garak/Ziyal story was just sort of OK for me. It had the unmistakable "they're setting up a longer-term story" flavor to it. It's been so long since we saw them together, that it is difficult ot feel terribly engaged by it. Then, it doesn't really resolve itself. So the best part is the Ziyal/Garak "romance," and Dukat's intimations of Garak being a ruthless killer. Dukat's tiff with Kira was also fine, if only because it included her witty retort about all Cardassians being ruthless killers. But overall, this was a weaker storyline. The Garak story also gave Worf some stuff to do. After a series of bad showings for Worf, this episode is a lot better for his character. I enjoyed the straight man humor with Garak, and I really enjoyed the setup work of Worf in the prison colony. Kevin: I enjoyed the almost asburd levels of 'normalcy' to the story. Young woman falls for least appropriate person she could pick. That's gotta be a full third of human literature right there. Seeing it play out against the tableau of the Dukat/Garak relationship gave it sufficient stakes for me. I loved the scene with Kira as well. The Garak/Worf stuff was fun not only for the dry humor, but I liked what it does for both characters. There's something compelling about a character who is so good at manipulation that he can acknowledge that he is manipulating you to your face and still succeed in manipulating you. It was spot on dialogue and completely in character for both characters. Matthew: So, the invasion. On the one hand, I'm pleased it's finally happening. After sitting on the proverbial pot for three seasons, it looks like the movement is finally going to occur. On the other hand, a lot of the drama with respect to DS9 and its role in the invasion is totally artificial - the rest of the fleet is... somewhere else. Even after we've gotten a half dozen foreboding reminders of just how important DS9 is to EVERYTHING. Seriously, Starfleet? Not even one ship? Not even the damaged USS Malinche that was dispatched not one episode ago to track down Michael Freaking Eddington? This phony drama then precipitates the notion of destroying the wormhole, which is treated far too casually by Sisko, who has just risked his life to receive visions from the Prophets regarding Bajor's lost temple. The Bashir changeling's sabotage was well handled, though. I liked the scene break from the prison to Fake-Bashir offering his friends sandwiches. Kevin: Yeah...I guess I don't over-punish this episode since it's a series length problem. I agree fully with the problems it presents for the story, but there was enough else going to distract me. One plot element I really liked her was bringing back Martok. Not only is Hertzler a great actor, but it's a neat way to foreshadow that they are looping in the divergences they have taken from the story, not simply abandoning them. Matthew: We are, of course, charter members of the Andrew Robinson Appreciation Society here at Treknobabble. One look at his deathbed scene with Paul Dooley's Tain should make it obvious why. He does such a great job of communicating conflicting emotions with his eyes, slight modulations of voice, and so on. His comedy is as sharp as ever, too, as when he goads Worf about joining Starfleet. Kevin: More than anything, the fact that Robinson was clearly acting like Tain was at least some kind of father figure since the first frame of "Improbable Cause," keeps the reveal from being too soap-operatic. Both Robinson and Dooley should be commended for finding the relatable emotion of the scene under ten pounds of make-up and sci-fi plotting. Matthew: Hey, look! Alexander Siddig can actually act! I enjoyed his Fake Bashir quite a bit. But actually, I enjoyed the real one, too. Here's the thing. Given what we've seen in DS9, I don't think Siddig is particularly charming. So when he is called upon to play charming, it usually flops. He can't save bad writing, and he can't live up to good writing. But frazzled? Put upon? Nearing death? Siddig can deliver. Kevin: I have to agree. Both Bashirs were fun to watch, and much like when they stopped asking Visitor to shout, it feels like they found the proper niche for the actor. I wonder if that influenced the eventual plot turn of his genetic engineering, to make the attempt at charm an act in its entirety. Matthew: I enjoyed Nana Visitor in her confrontation with Marc Alaimo's Dukat. She didn't overact it. Alaimo himself was good, and though the story thread itself wasn't my favorite, I bought into his protectiveness towards his daughter. Speaking of Ziyal, Melanie Smith is probably the best of the actresses in the role. Granted, she's also gotten the best material, but Smith did a good job of making her seem like a real person who we'd actually want to be around. Kevin: The producers were happy with the first actress, but wanted to age the character to give it more range, and based on Smith's performance, I am glad they did. She really nails a genuine, relatability that older actors have failed to find in Star Trek parts. I completely bought she was a young woman dazzled by the sophisticated older man, however unwise that may be. Matthew: The new Jem'Hadar ship is a neat design. It kind of looks like a Promellian battle cruiser. The overall fleet looked pretty good, though it still suffered from that "cut and paste" look that some of DS9's bigger fleets have had. Still, I appreciated the ambition. Kevin: The "emerging" effect of the fleet in the nebula was well done, given the tech of the time, and I always love a reuse of the Mutara Nebula. 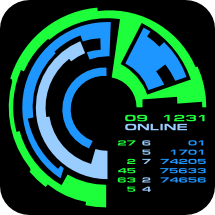 I agree on the Dominion ship design. They felt of a piece with the smaller, scarab ships. Matthew: I loved the asteroidal moon prison model, and the interior set, too. These are the sorts of set designs and exterior graphics that really put us in a place, and make it seem really cool. I liked the fight arena, it had a sort of utilitarian feel, which befits both the setting and the people who created it. Some of the Jem'Hadar makeup had an "appliance" look to it, especially the sleeve on the Jem'Hadar who strangles Garak. The Breen looked kind of silly as always. Kevin: The asteroid itself, as well as the detail work on the prison colony were great. Little touches like stars through the windows and trapezoidal wall panels really made it feel like a real place and the multitude of shadows gave it a cool, almost noir feel. Matthew: This is a 4 for me. My main beef is the artificial drama created by the fleet being... elsewhere. I can take 90% of the fleet being deployed somewhere else. I can even take all but one or two ships being elsewhere. But zero? This just makes Starfleet look dumb, and stories that do that tick me off. I also think the Ziyal story could have been trimmed or placed in another show to let the other stories breathe more. Nonetheless, this is a tight 45 minutes of show that has a nice sense of momentum to it, and it definitely sets me up to want the next installment. Kevin: This makes it to a 5. Like I said, the slightly overfull plotting actually feels purposeful to me. The situation is out of control, and the episode surfs the edge of that control well. I cared about all the stories and was on the edge of my seat for a week to find out what happened. It did an almost perfect job of doing what the first half of a two-parter is supposed to do. That makes a total of 9.